Samsung has officially released its second smartphone to feature Dual Camera setup on the back side. Beside the Dual Camera, another highlight of the smartphone is its support for Bixby, Samsung digital assistant that competes with Apple’s siri and Google’s assistant. 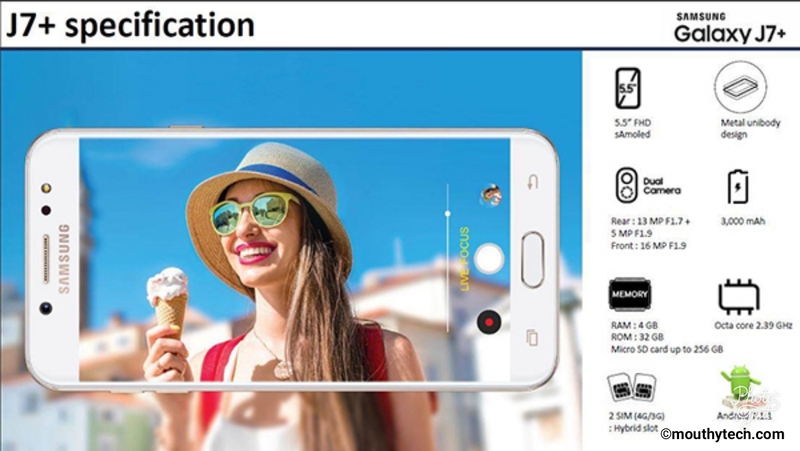 Samsung Galaxy J7+ is a mid-range smartphone, an upgrade to Samsung Galaxy J7. It runs on Android 7, and comes with nice features like an Aluminum body, a 5.5-inch ALMOND display with 1080 x 1920 pixel resolution, Dual app (two whatsapp can run simultaneously) fingerprint scanner in the front and 3000mAH battery. It is powered by 2.4GHz octa-core processor. Where To Get The Smartphone. You can pre order the Samsung Galaxy J7+ from Jumia Here or any online shop. See also Gionee A1 lite Full Specs. What do you think about this smartphone? Will you go for it or not? Let me know in the comment box below.